Ok, so here's something about me: I don't get what's so great about "The Big Goodbye." If you're unfamiliar with this episode, what basically happens is that, on the way to meet some ridiculously traditional insect guys that only Picard can talk to, he gets super stressed out and Deanna suggests he make use of the new holodeck programs. He gets there and totally loves this Raymond Chandler/Dashiell Hammett type of private detective program where he gets to play the lead--Dixon Hill. Yes, his outfit is awesome and there are some great bits in this fun, season one romp. But this episode became seriously iconic. People LOVE this episode. And, while I love a lot of things about it (namely the part where Picard comes out at the end, tosses his jacket on his captain's chair, and loosens his tie before talking to the insect guys) I just don't get why it's such a big deal. And, the thing is, I really want to get it. I love Picard. I love detective stories. 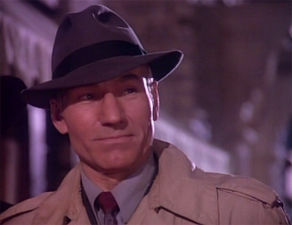 I love holodeck-gone-wrong stories (because, yes, that is a thing) and I love romp episodes. But, no matter how often I have tried, I've never been able to feel the incredible fan devotion that other Trekkies feel about it. So, if you're one of those Trekkies who go ga-ga over Dixon Hill, please explain it to me. I want to love this episode as much as you do. Tell me why you love it. I just watched this, and I think people love it because it's like a period piece inside a sci-fi shell. People also love time travel, and when the Enterprise crew start talking about getting back to their world, the holograms go 'huh?' and it's all very cute. Plus it was the first episode to be both a period piece/holodeck crisis, so I think everyone thinks 'first is best'? But I'm with you, there wasn't anything really special about it. I liked the Naked Now the best so far!